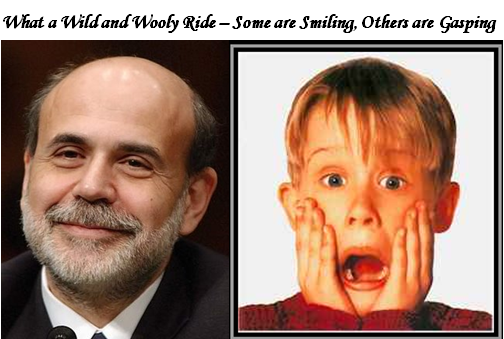 Ian Woodward's Investing Blog » What a Wild and Wooly Ride! « Three Cheers for the HGS Investor Team! What a Wild and Wooly Ride! Talk about a wild and wooly day! There was a rumor that there was a possible bail out of the Municipal Bonds – MBI skyrocketed 33% and MBK was up 72%. Also City Group was up 8%. Net-net the market produced a 600 point swing between friends. Talk about trading in nanoseconds, but there is always money to be made if you have to put bread on the table. Ron’s early spy of the retailers yesterday was an excellent call as that same set of stocks which I showed you yesterday is now up over 14% in two days…if you had the courage to play them. The Transports, Financials and Home-builders were the places to fish today. However, I do not want to give you the impression that we are Jack-in-the-box types on this site, so although this bounce play was expected it was certainly not looking that way at mid-afternoon. Of course this is a counter-trend rally in a Bear Market and since it was so powerful there may be another day or two for it to play out, before the Bears come roaring back when this peters out. So keep your powder dry and since we have a few Bingo’s under our belt, wait for the possibility of an Eureka with strong indications of at least 150 New Highs for a follow through day after that. The New Lows hit big numbers of 533 and 952 on the last two days so I need hardly say these are wash out numbers. Likewise, New Highs are a paltry 5 and 12, respectively, so don’t get too itchy until we see a decent confirmation that there is at least a reasonable rally on the cards. It goes without saying that the VIX had all sorts of gyrations today, but I particularly want to draw your attention to two spidery legs which suggests there was some excellent shenanigans going on, which you and I would not decipher. Here is a screen shot I captured to make my point and if my good friend from VixandMore has any insights I am sure he will cover it on his blog. 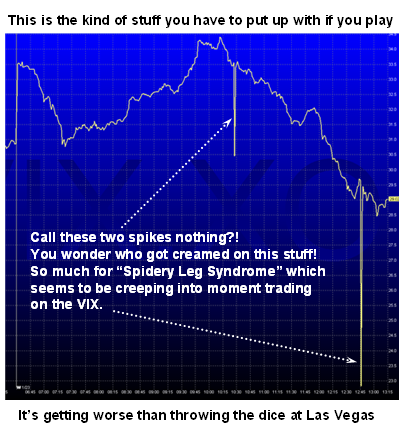 I am not an authority on the VIX, but certainly follow it in my work as I am sure most of you do too, but I have never noticed these spidery legs before on the VIX. Well, tomorrow is another day and we shall see how the wind blows. At least we have had the kind of fear hit the market to move towards capitulation. If it was, expect a re-test of the bottom at around 11,640 on the low which is what it tested today and held from yesterday’s low. So they are trying to hold the flood gates from opening further at this level of 18% down from its high. If not, the gurus will trumpet that the Bear Market numbers are officially achieved and claim victory. 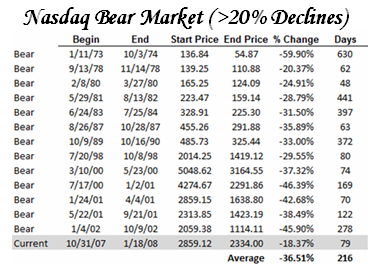 Whether it holds at this level is unlikely as past bear market statistics are a lot worse, judging from past bear market statistics for the Nasdaq since 1973. This entry was posted on Wednesday, January 23rd, 2008 at 4:44 pm	and is filed under Market Analysis. You can follow any responses to this entry through the RSS 2.0 feed. Both comments and pings are currently closed.